The gap between satire and reality can be dangerously close at times and watching Brexit it is easy to start feeling as if you are sitting in on high level Cabinet discussions with only the names changed to protect the guilty. It is set in a near future where the Ma(y)tron has ceased to be Prime Minister and the UK is three years into an 18-month post exit transition period. New PM Adam Masters, played by Timothy Bentinck (David Archer in Radio Four’s The Archers), is trying to come to terms with his Brexit brief and looking for a solution that the many sides of his party can agree upon. His own indecision on what the UK’s future relationship with Europe should be, along with his desire not to become the shortest serving PM in history, leads to him offering the key role of Brexit Secretary to an ardent Remainer and the Trade Secretary post to a hard Brexiteer, played by Pippa Evans and Hal Cruttenden respectively. It’s a strategy that would seem ludicrous if it didn’t carry with it so many echoes of the present day. Cutting away from the internal political struggles, Masters also has to deal with Helena Brandt (Jo Caufield) the EU chief negotiator, even if he is still lacking anything concrete to negotiate about, while underpinning all of this, his political consultant Paul Connell (Mike McShane) may have a stronger interest in the politics of Brexit than he claims to have. A razor sharp accuracy runs through Robert Khan and Tom Salinsky’s script. They home in on the contradictions in every aspect of the Brexit process, but while you feel that they have both feet in the remain camp, they are not blind to the imperfections of the EU and the play will not entirely alienate leave supporters. The all-star cast play their roles to perfection, each of them knowing that they don’t need to overplay the lines for the humour and irony to emerge. 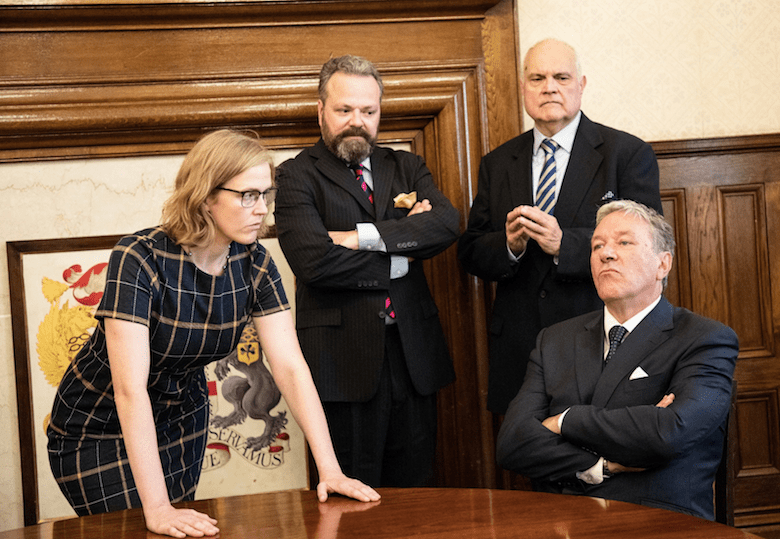 Closer in style to Yes Minister than The Thick of It, the play makes superb entertainment out of the biggest crisis facing British politics as well as providing a useful commentary on how we got to this position and what we may have to do to get out of it.